Lock up your chickens in Clayton!!! 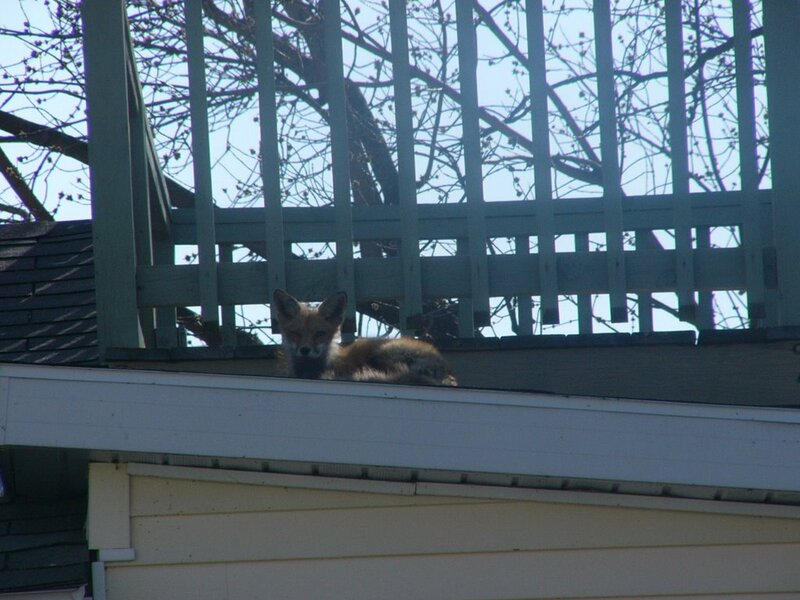 This fox was spotted on a rooftop deck of my neighbor's home in Clayton. Only in Upstate NY kids... Only in Upstate. This is how I envision the blog working - you are either a shopper with a keen eye or a maybe even a good hearted employee of one of the major local retailers. When an unadvertised special hits the floor or you score a great deal, you send me an email at nnydeals@yahoo.com. I'll start publishing the deals as I gain a critical mass. Hopefully, it will save you some $$$ and make for some interesting reading. I'll start it off - Today I saw a Panasonic GS-32 Mini DV camcorder in Sam's Club for $175. This camcorder was $250 a week ago and is well reviewed on the web. Oil and gas prices remain poised to hit higher highs for the foreseeable future and despite the rhetoric placing much of the blame on the oil companies I think it is important to remember the key contributors to the record prices. 1) US Consumers - We are a nation that likes to blame McDonald's when 40% of our population is obese but like it or not we are the biggest factor in high prices. We simply consume too much oil - directly in the form of gas for our inefficient vehicles and indirectly through our consumption of products manufactured in China (which is using more oil every day because of our demand for their inexpensive goods). 2) Market traders - Oil trading has become increasingly more volatile as the volume of data points has grown substantially over the last 10 yrs. In the past, inventory data was the most meaningful source of oil data for the markets, however today traders can react to a headline from Nigerian rebels or a quote by Pres Chavez. 3) Big Oil - Clearly they did not explore enough in 1990-2000, but beyond that I don't see much blame to lay at their feet. 4) International and Domestic leaders - I had left this out of our previous discussion partly to avoid any partisan diatribes, but the impact is clearly substantial. I estimate that 10%-12% of the current price of a barrel of oil is due to market concerns that the US could possible strike Iranian "nuclear" facilities in 2006. While I discount this as having a very small chance (no one wants another war going into the mid-term elections) the markets are pricing a 20-40% chance of this occurring. Iran represents an oil supply of 2.5 million barrels/day. The "excess daily global supply" is somewhere around 1.5 million barrels/day. It is clear to see that any disruption of Iran's supplies could have a dramatic effect on the global markets. Google has become a verb, they've made the net cool again, they've made Venture Capitalists all giddy, they've made themselves wealthy beyond all imagination..........but are they Emperors in Googleplex wearing any clothes? I've spent a little time reviewing all of Google's latest offerings and the range of response has been from "that's pretty cool" to "huh". Google is starting to show the signs of a company striving to do many things well, but may end up doing nothing well. I offer up two criticisms - first just because you can do it (froogle anyone?) doesn't mean you should and second, where are the revenue streams?? Everything they offer is free. I thought in 2003 advertisers would start to figure out that all those click-thrus were worthless, but I clearly was wrong. Maybe it's 2006 or 2007, but eventually people are going to get the idea that sponsored links are a terrible investment for most businesses. I've been a Google cynic for quite some time (partially owing to my own inability to convince the co-founders to let my VC firm participate in the 3rd round of financing) but I think there needs to be some time to pause and reflect on their mission statement. Google is being run like it's a 9yr-old boy with overindulgent parents. Today they work on maps, tomorrow news, then a calendar, then.........just my 2 cents. Oil is at $71, gas is racing to $3.20 and the market is up 200 pts??? Huh? Ok, so let's backtrack and cover the perverse logic of the Neanderthal/jock hedge fund traders that control a huge chunk of the market action now. Fed stop raising rates = stocks more attractive vs. Treasuries. Hmmm, true, but the Fed will only stop raising rates when it sees that the economy is COOLING OFF (read: earnings are likely to start falling) and thus multiples and prices for stocks should come down. There have been some pretty good studies done that show this logical assumption - when the Fed stops raising rates it is because the economy is weakening and that should be bad for stocks - is the correct assumption, but most big money managers think of 1999 as ancient history so there is no reason to preach reality to them. So today, the market ignored bad data all around to get giddy b/c the Fed might be almost done raising rates. Possible, but I'm still a believer that troubled waters lie ahead. I think we're facing a situation where inflation dictates that the Fed HAS to keep raising rates DESPITE a weaker US economy. I'm not sure everyone is really prepared for just how weak the economy could get over the next couple of years. With 20-40% of new employment in some markets coming from the residential/commercial real estate industry which is poised clearly at the edge of a very deep ravine, there is a potential for the impact to be dramatic. Coupled with inflation on every corner - gas, food, entertainment, etc - I think you have the makings of an interesting 2008. I'm still a believer that the perma-bulls have enough gas to get the market up another 200pts or so, but I'm definitely nibbling on short side here and I'll build this position through Memorial Day. This article from the London Times highlights a growing problem with Pharmaceutical companies and their ever present marketing push. One of the greatest long-term risks facing the US the excessive cost of our healthcare system. Every layer of the system deserves some blame - Medicare/Medicaid, Hospitals, Doctors, Patients (for expecting a cure for every disease - "But you fixed that guy on ER last week"), Insurers, Pharmaceutical companies and the lawyers that sue the Pharma companies. By reaching out to consumers through aggressive marketing campaigns the Pharma companies are manufacturing demand that might otherwise not exist. If pharmaceuticals were like any other consumer product (ie, books, sporting goods, etc) that you paid for out of your own pocket this would not be an issue. Would you let major company talk you into paying $200/mth to treat a "disease" that you may not have? Of course not. But through the wonders of insurance, that $300 prescription becomes a $10 co-pay. The problem is that someone (the Federal/State government, the insurer, your employer) is footing the rest of that bill and financing meaningful revenue streams for drug treatments that might otherwise be small, niche markets at best. I disagree with the alarmist tone of this article and their title about drug companies "inventing diseases" is misleading at best. I do, however, believe that the drug companies attempt to make fairly rare conditions seem common and normal stages of aging appear to be treatable illnesses. When I first began my research on the North Country Real Estate Market in Jan 2003, I can remember commenting to a friend that the entire MLS (multiple listing service) contained only 26 properties (land/commercial or residential) priced over $300k (roughly 2.5% of total listings at the time) . Today the total number of properties priced over $300k stands at 177! With the total number of listings standing at 1,710, this means over 10% of listed properties are now over $300k. I contend that a number of these listings are "Window Sellers" - listing a property for an outrageous sum in the hopes that a developer might bite and give the seller the equivalent of a winning lottery ticket. However, the fact remains that the market in high-end properties (be they commercial, residential or seasonal) has grown dramatically. Buyers of premium properties in the North Country need to be very careful not to overextend themselves as valuations are getting more difficult at to justify at these levels (speaking in broad terms, of course). 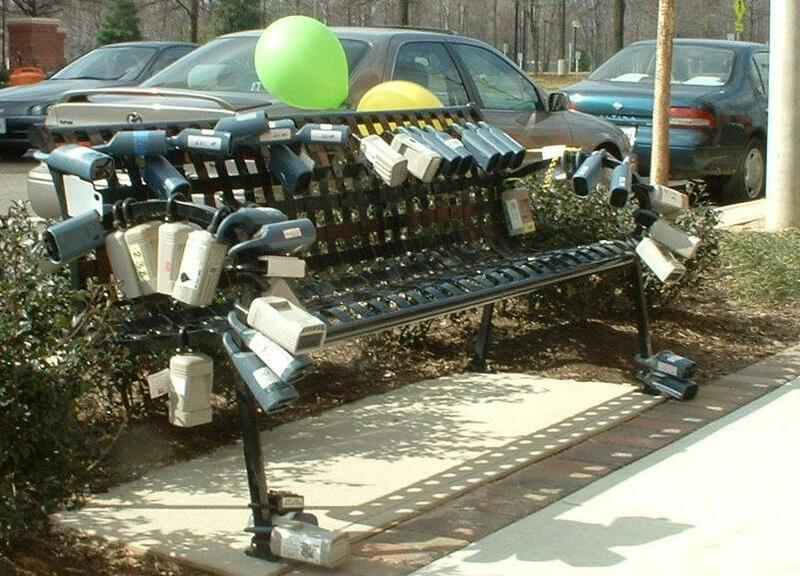 Now, this is a picture worth a 1,000 words - check out this photo from bubble meter it shows a bench near a condo complex in Virginia. Apparently, there are 220 units in the building and there are 47 lockboxes (lockboxes are used by listing agents to give other agents access to a property without the listing agent having to be present). So 20%+ of these condos are for sale, that's a buyers market. I preach a need for the US consumer to spend less and save more.......yet tonight I offer you two of the most bizarre shopping websites you'll ever see. 1) Unclaimed Baggage - You've seen them profiled on CNN, NBC, MSNBC, etc. This is the graveyard for your lost luggage from your trip to Vegas last year. After a bag, remains unclaimed for 90 days, it is sold in bulk quantities to this resaler outside of Huntsville, Alabama. Apparently the deals in the store can be quite impressive, but the online selection is meager at best. A couple of my personal favorites are the 4-6 person survival raft Side note: What rocket scientest took this on the plane, but packed it in his CHECKED BAGGAGE? "No, no, honey we're ok if this plane goes down. Remember? I packed the survival rafts." "Did you put those in the carry-on or the checked bags?" or the Versace comforter for just $1,000. 2) Steal It Back - This site was established by former police officers to capitalize on that bike that was stolen in 1992 from the trunk of your 1984 Ford Thunderbird. The site works with local police departments to accumulate stolen goods which can not be returned to their rightful owner. After the police are done using the item as evidence it can be auctioned off to the public. For the most part, the merchandise borders on junk, but I've seen boats, signed lithographs, and tons of useless stuff on the site. "We're going down in a spiral to the ground"
At the risk of scaring away all of our new readers with a story on statistics, this has to be the consumer/economic story of the year so far. "Sales of second homes increased by 16% in 2005 to a record 39.9% of all U.S. housing sales, the National Association of Realtors said Wednesday. Sales of vacation homes rose 16.9% to a record 1.02 million, while sales of homes owned for investment purposes increased by 15.7% to a record 2.32 million, the real-estate trade group said, reporting on two surveys. Home owners in the South bought the biggest share of investment homes: 38%." So four out of every ten existing homes sold in the US last year was a vacation home or purchased as an investment?!?!?!?!?! Vacation homes prices tend to fluctuate to a much greater degree than primary residences because when times are tough or rates go up and a family is looking to cut costs, the house on the lake is one of the first things to go. The investment homes # is off the charts. When I was in Miami last year I was struck by how fixated the entire community was on housing and prices. It felt very much like the stock market when your Dentist was telling you about the killing he was making on Ariba.com. In my opinion, there will be some very affordable condos in Miami/Key Biscayne in about 5 years. Gas at $3.00 Again!!! Who's to Blame? There has been much made in the news lately about the big oil companies and their enormous profits in 2005. Granted the profits were unusually large and those profits came at the expense of you and I, the US consumer, but I think it is worth while to discuss the how & why of higher oil prices. What's the deal??? Who's making the $$ and why? First, for the most part the station owners have very little flexibility in pricing. 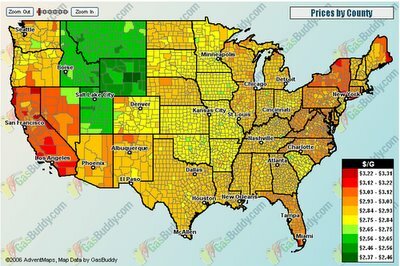 If they are a branded gasoline chain (Exxon, Mobil, BP, etc) their pricing is pretty much set for them. The independent gas station has the right to buy from the lowest cost wholesale dealer and thus, will often have the best pricing in a given market. So, you might ask, if I can't blame the station owner, how about the big oil guys making $36 billion in profits? Well, that would seem to be the logical jump, but oil is different from most other businesses. Walmart determines the price of the goods on their shelves. Time Warner tells you what you will pay for their cable services. Oil, however, is a commodity and it's price is - in a perfect world - driven by supply and demand in the marketplace. So, Exxon et al are really just selling their products to the consumers at a price set by the futures markets. When oil was selling for $10/barrel in 1998 it wasn't Exxon that chose that price, it was the market. I'd point to the major gold producers that are churning out all the gold they can at $500/ounce because they remember the days of $375/ounce really well. Big oil deserves some of the blame for their post-Katrina information flow which spiked prices, but for the most part their profitability is a by-product of supply/demand issues which are out of their control. Okay, so if it's supply/demand let's look at that equation. Supply is pretty tight around the world right now with Iraq pumping less oil than pre-war and refinery capacity still constrained post-hurricane season. Demand, however, is the real problem in my opinion. Enormous new demands from China, India and the US are pushing demand for oil to unseen levels and unfortunately, I don't see a slowdown in demand coming. The final factor is the equation is the market itself. Futures and options on futures for oil were really a niche 5 years ago with a handful of skilled traders investing alongside major consumers of oil (airlines, etc). However, this market has become the new wildwest for aggressive hedge funds and hot traders. Over the past few weeks oil prices have moved up on reports by scientists forecasting another strong Atlantic Hurricane season. In the past, hurricanes would move the oil market, but only when you could see them shutting down the rigs in the Gulf of Mexico. Now the forecast for an upcoming hurricane season is moving the market - that is a sure sign of speculators. * Yourself and your neighbors - 50% to blame because your car still gets only 19 miles/gallon and you like buying $0.88 dinnerware at Walmart made in a Chinese factory which uses more and more Russian and Mideast oil every day. * Speculators in the oil markets - 20% to blame - This is a small group, but they exert a tremendous amount of influence over the price of oil. "There was a time when Paul Allen, not Bill Gates, was the boss at Microsoft. When it came time to visit Albuquerque to demonstrate that first BASIC interpreter to the folks at MITs, Allen made the trip, not Gates. It was Paul Allen, not Gates, who was later offered the job as head of software for MITs -- a job I have in the past characterized as the single most expensive position in the history of employment because accepting that job meant that Allen got only 36 percent of Microsoft’s founders shares, compared to Bill Gates’ 64 percent. These roles changed over time, of course, and what clearly precipitated the change was Paul Allen’s health. He contracted Hodgkins Disease, a form of cancer, in 1982 when Allen was in charge of the development of MS-DOS 2.0, a complete rewrite of PC-DOS 1, which was itself mainly derived from Seattle Computer Products’ Quick and Dirty Operating System (QDOS) that Microsoft had acquired when Digital Research was unable to come to terms with IBM about using CP/M for the original PC. To his credit, Allen stayed long enough to finish the job, delivering DOS 2.0 then leaving the company forever, eventually to have a bone marrow transplant that cured him completely. But during one of those last long nights of working to finish-up DOS 2.0, something happened. I have heard this story from two people, each of whom was a friend of Allen’s and in a position to know. Each told me the same story the same way. I am not staking my reputation on the accuracy of the story, but I am saying I have it from two good sources. Paul Allen certainly won’t confirm or deny it, so I’ll just throw it out for you to consider. During one of those last long nights working to deliver DOS 2.0 in early 1983, I am told that Paul Allen heard Gates and Ballmer discussing his health and talking about how to get his Microsoft shares back if Allen were to die." Now before we go Oprah on Gates' backside, let's remember that Mr. Allen is worth roughly $14 Billion and thankfully he is fully recovered, so he's doing a little better than most. But still, could you imagine overhearing a conversation where two of you co-workers were discussing plans for your assets if you passed? No links here, just some general commentary. As noted yesterday, the market gurus got all giddy when GM appeared to close the GMAC deal and LU/Alcatel became official. But like all aging Bulls this one seems to be running a little short of breath. I still think we've got one more good leg up another 5% or so, but then it's good night Eileen. It's going to be hard to pick that top, so I'll be neutral to stock specific short in here. I've not back-tested this theory, but I think there is a meaningful shift in market mentalities post-2000. In the past, when stocks jumped on news (or fell on bad news) it was very easy to pile on and join the trend. I think there is a pretty good opportunity for hedge funds to trade the gaps (buy the big drops, sell the big jumps) for gain. Take today - if you sold the leading % gainers at 10am you would have made about 10% today. Not a homerun, but not bad either. I'm going to run some data and trial portfolios over the coming weeks to test this theory a bit more. *** Full disclosure my last jobs were in highly volatile option oriented hedge funds. These are not investment vehicles for the average investor and my comments should be viewed as a reflection of market psychology, not a guide to personal investing. A pretty big moment in the recording industry as a song takes the top spot in the UK based solely on downloads. "Gnarls Barkley and the song Crazy made pop music history yesterday as they went to number one based only on the number of people who paid to download it". I don't like to do much stock specific commentary for obvious reasons, but it's worth noting the passing of Lucent as a result of their merger with Alcatel. Lucent still has a ton of products, customers, etc, but I'll never get that $3 price out of my head. Sure you're up from the $1 price where you traded in Oct 2002, but looking at your 10yr chart this last little run barely even registers. This is sure to spark talk of more consolidation/acquisitions in the space (NT, Ericsson, etc) but this industry feels like the US domestic car market - people still buy their products, but why? Speaking of GM, there is talk that GMAC might be sold. Good riddance. Assuming the price is viewed as sufficient this should buoy GM and the markets at the open, but this does not fix GM's product problems (and that pesky Delphi issue - yeah they mention the big B word for GM). Basically two economics professors have put forth the theory that housing is not overvalued if the home would rent for a price inline with the monthly cost of ownership. This alone is not a scandalous theory, but it shows the professors are thinking in a vacuum. Their math assumes that rents are stable to rising. In 1991, just as real estate was bottoming in the tri-state area, rental rates at premier high rises were off 50% or more from their peaks. If a fixed part of your equation (rental rates) becomes a variable, your equation becomes g-a-r-b-a-g-e. They argued that the value of a home is determined by the rent it could fetch. Calculate the future rents, subtract mortgage payments, taxes and other costs, factor in a good annual rate of return of 6 percent or more, and one should be looking at the proper price of a house or condo." I had one final thought on housing tonight - Ask a CFO if he builds a factory or a new corporate headquarters what type of return he'll expect to show on that physical asset. Once she has stopped laughing you will probably hear something along the lines of "Well, of course we don't expect to show a return on the asset itself. Physical plant is a depreciating asset - meaning it's value should and will decline over time." I know it is different for housing an 80 yr house will be worth more than it was when it was built, but the question is should it be worth more?